Court Finder is a navigation app meant to guide you to the nearest public basketball court. It was brought to us by Belitz & Garthoff GbR, costs $0.99 and is compatible with an iPhone, iPod Touch, and iPad. In case you had not noticed, a basketball court location is not something that you can look up in the yellow pages. I have often been out searching for a place I can play basketball outdoors, but there was absolutely nothing to consult and no starting place I could think of to begin my quest. Even though I have a gym membership, I would rather be outside playing then be cooped up indoors. There is something fulfilling about being out and getting fresh air while playing sports. Court Finder fits the specific niche of making us aware of how many courts there are within a certain radius of where we are. There is a navigation system built into the app so you can search everywhere on the map to find courts within the U.S. and all over the world. The advanced settings allow you to toggle between the map type: Map, Satellite, or Hybrid, and the unit type: Miles or Kilometers. Like most of these apps you can add Courts and save them to a list of all your favorite courts. There is also a list included of the Most Viewed, Best Rated, and Recently Added courts. This feature allows for you to explore well-known or highly rated courts to get your own experience and judge for yourself. 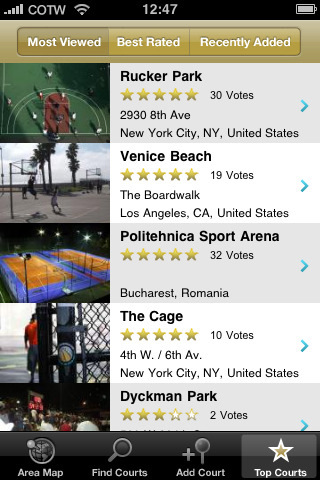 Rucker Park in New York City takes the top rating while Venice Beach in Los Angeles trails behind for third place. 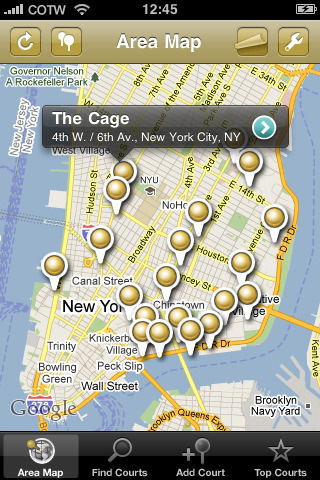 You can find a court using your zip code and the app will drop pins all over the map showing the nearest courts. Obviously this app is only relevant if you or your friends are people who own a basketball and like to shoot hoops. Otherwise I do not see much of a point in purchasing Court Finder. It is impressive that wherever you are in the world, Court Finder will locate a basketball court for you to play on, just do not forget to pack your ball! AppSafari review of CourtFinder by Courts of the World was written by Vanessa Paszterko on October 25th, 2010 and categorized under App Store, Maps, Search, Sports, Utilities. Page viewed 4063 times, 1 so far today. Need help on using these apps? Please read the Help Page.